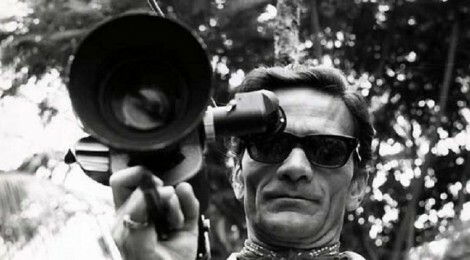 November 2015 marks the 40th anniversary since the untimely death of Pier Paolo Pasolini, murdered at Ostia, near Rome. He was 53. Born at Bologna on 5 March 1922, it is now said that he was one of the artists most persecuted in life and possibly most honoured in death. More and more people now see him as a visionary thinker and a major figure in Italian literature and art. He was a multi–talented man: columnist, essayist, poet, novelist, artist, actor, film director, intellectual and political figure surrounded by controversy. During his childhood and youth he spent a lot of time at his grandmother’s house in Casarsa (Friuli) where he acquired familiarity with the local language – friulano. He is buried there, next to his mother, and his grandmother’s house has become the Centro Studi Pier Paolo Pasolini. From 1941 to 1953 he wrote some 60 poems in friulano. Here is a very short one in the series “Poesie a Casarsa”. Sera luminosa, nel fosso cresce l’acqua, una donna incinta cammina per il campo. Io ti ricordo, Narciso, avevi il colore della sera, quando le campane suonano a morto. Radiant evening, water rises in the ditch, a woman with child walks in the field. I remember you, Narcissus; you were the colour of evening when the bells toll the knell.